Deep fry the burger patty in hot oil. Keep aside. Mix mayonnaise and sauces.if you like you can mix some shreaded carrot and cabbage in this miture. Keep aside. Slice the burger into two roundels. Apply some butter and toast each burger slice from both sides. 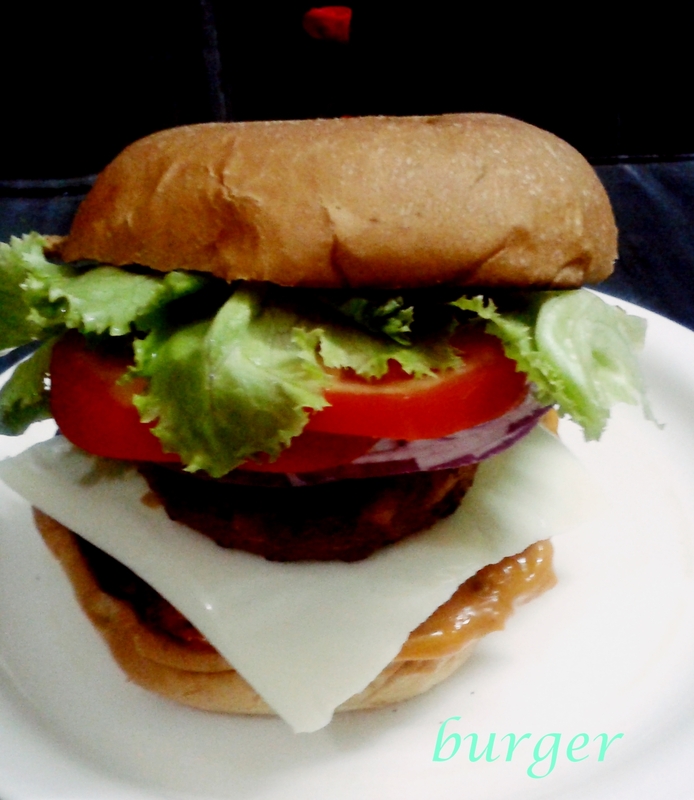 Apply mayonnaise sauce mixture on the lower slice then place a burger patty over it. Now place a cheese slice then a cutlet then onion and tomato slices and salad leaf. Finally cover it with the top slice and seal with the help of a toothpick. Take a non-stick pan and put the strawberries in it. Switch on the gas and cook the strawberries. When the strawberries become soft crush them with the help of a potato masher. Add sugar and start cooking on medium to high flame stirring continuously till you get the desired consistency, it will take 10-15 minutes. Add lemon juice and switch off the gas. Store it in a sterilized glass container when it is completely cool. You can serve it in a no. of ways like on bread ,cakes ,pan cakes,cheese cakes,waffles,tarts,shakes and with ice- cream. Same way you can make Kiwi sauce. Mix the orange juice, zest and sugar in a small saucepan. Simmer the juice mixture over medium heat, stirring occasionally, for about 15 minutes, until a thick, syrupy sauce has formed. (At this point, you should still be able to pour the sauce, but if you like, continue reducing the sauce to make it even thicker.). If you like you can stir in a tablespoon full of butter and simmer for another 2 or 3 minutes. Remove from the heat and leave to cool. But that is optional. Remove from the heat and leave to cool. 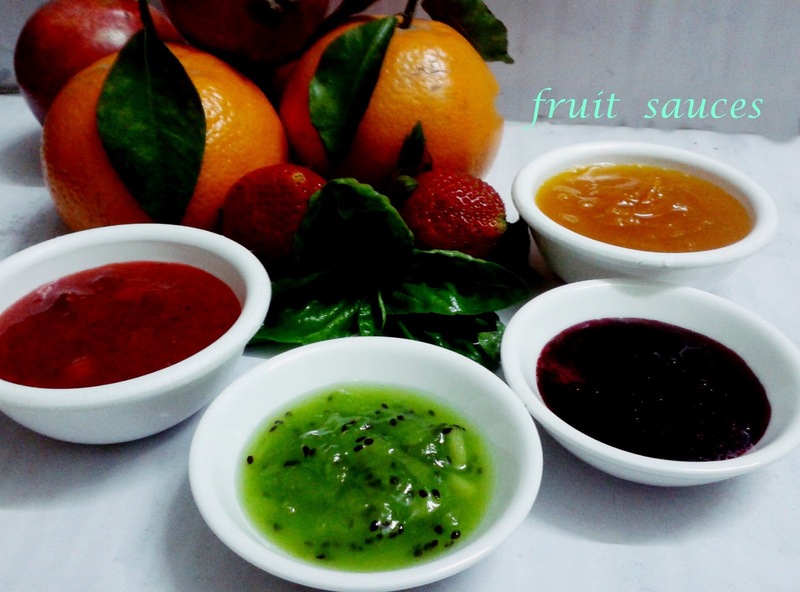 Serve the orange sauce chilled or at room temperature. Place the pomegranate juice, sugar and lemon juice in a saucepan set over medium heat. Cook, stirring occasionally, until the sugar has completely dissolved. Once the sugar has dissolved, reduce the heat to medium-low and cook until the mixture has reduced to 1 1/2 cups, approximately 50 minutes. It should be the consistency of syrup. Remove from the heat and allow to cool in the saucepan for 30 minutes. Transfer to a glass jar and allow to cool completely before covering and storing in the refrigerator for up to 6 months. If you like you can add salt to taste in this sauce.